The Phil Jones Briefcase is a very compact, reasonably lightweight (under 30 pounds) bass amp that is perfect for practicing at home or taking to a small nightclub gig. 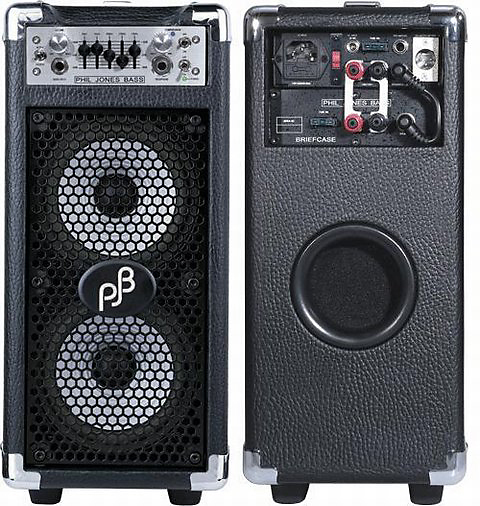 This mighty little combo amp is ideal for small venues such as coffee houses or intimate jazz clubs, but has features and options that could make it fill a very big room or even tackle outdoor gigs and sound fantastic. It was hard for us to imagine that such a physically small combo unit could make such a big sound with great tone. Phil Jones Bass specialize in the implementation of five-inch drivers in their speaker arrays, which deliver a punchy and immediate tone that you can’t believe until you experience them. The options for powering this mighty little combo (rechargeable batteries, car cigarette lighter, and more) and expandability are numerous. 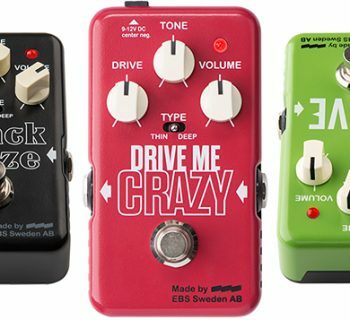 No longer does your practice amp have to be a cheap toy that bears little resemblance to the quality of your big rig. If you sometimes need a very compact bass amp but still want something with pro-class sound and features, the Briefcase is one amp you need to check out. 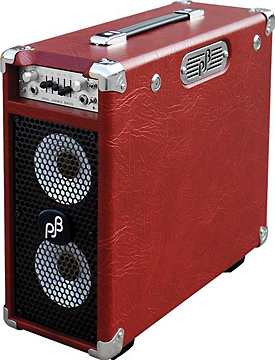 The Phil Jones Briefcase is a 100-Watt combo bass amp featuring a pair of proprietary Phil Jones Bass five-inch drivers. While your brain is busy amusing itself with thoughts of how this can’t compare to something like a fifteen-inch driver, you’re right. It doesn’t compare. It’s actually superior — at least when multiple drivers are configured together in an array. Phil Jones is a speaker design engineer and expert, having worked for years in the audiophile world designing speakers for companies like Boston Acoustics. It was his work developing drivers for premium home theater installations that lead to the idea behind using large speaker arrays comprised of numerous small drivers. A large speaker is slow to respond to the initial attack of your sound, and slow to stop vibrating. Small speakers have much less throw/travel, which is what enables them to deliver a more immediate, punchy response. Connect enough of them in an array and you actually end up with more speaker surface area, and more magnetic drivers, than the sum total of your traditional 4x10 and 1x15 speaker designs, but with the improved performance characteristic of smaller speakers. Phil Jones makes speaker cabinets with those extended arrays — look for reviews of some larger rigs later this year. While the compact nature of the Briefcase amp reviewed here isn’t going to deliver the kind of projection of a larger speaker array (or larger speakers), we wanted to explain the principle behind the design so that you don’t write off this tiny amp without giving it a chance. It’s hard to embrace a radically different approach to speaker design when you’ve been used to doing things a certain way for years. But there are real alternatives to big, cumbersome speaker cabinets. At just under 30 pounds and with a handle on top, the Briefcase is as compact as its name suggests. But just because you can play this thing in your bedroom or a café, it isn’t short on pro features. The front panel has an Active/Passive switch for use with any bass guitar. There is a five-band graphic equalizer. There is also a very effective compressor with a variable sweep control knob to dial-in just the right amount of compression. Finally, there is a headphone jack for private practice. The rear panel houses the AC power connection, with a voltage selector to switch from 110 to 220 Volts (with a plastic cover to prevent accidentally moving the switch). There’s so much more to powering this portable amp, though, like the 12V DC coiled charging cable for powering the amp from a 12V source such as your car cigarette lighter plug! There is also a 12V DC battery input terminal for use with a dedicated car battery (very cool), or smaller batteries, depending on your power requirements. You can actually install a rechargeable battery — like one commonly found in computer uninterruptible power supplies — into the base of the amp. This will add a few pounds of weight, but if you dream of playing your bass on a desert island, now you’ll be able to hear it! You should get between one to three hours of battery life before needing to recharge with a typical internally installed battery. For an extended jam on the desert island, you’ll probably want to attach a car battery externally. Speaking of automobiles, the 15 amp fuses in the Briefcase are actual car fuses! These are easy to find in any auto parts store, and if there is no store around, you can always borrow one from your car until it’s time to pack up from your gig and go home. The car fuse is a fantastic idea that we think every manufacturer should embrace in their amps. The rear panel has some additional features that are almost never found on a practice amp. The first is a speaker output (4-16 ohms) that allows the user to use the amp with other (larger) speakers. Lastly, there are Pre-amp out and Balanced line out connections for direct sends to a house PA or to drive an external power amp. The Phil Jones Briefcase is truly plug and play and we mean virtually anywhere! 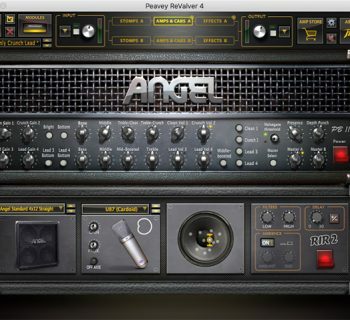 The AC and DC power options make this one of the most versatile bass amps we have ever seen. Installing a rechargeable battery (car or UPS) is simple — just unscrew a plate on the bottom and inside, remove a cable tie that holds the connecting terminal in place, and connect! The passive/active switch allowed us to play the Briefcase through a variety of basses with different pickup configurations. 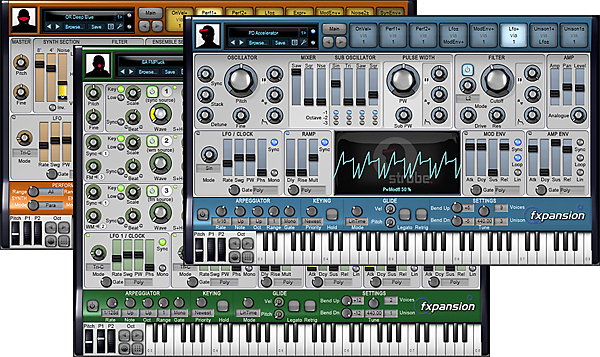 The graphic EQ and compressor were both very straightforward in their use. The compressor was preset with a 3:1 ratio and worked well. The Direct Out had a fixed level, and it wasn’t affected by our adjustments to the amplifier volume. Of course if you change volume from your bass, you will reduce the level sent to the house as well as to the internal speakers. We played a variety of basses through the Briefcase including a Fender Jazz Bass, Kubicki Ex Factor, a Dean five-string acoustic bass, and a standard upright bass with a Shadow SH 965 NFX-B Nanoflex pickup and preamp system installed. All basses sounded beautiful through the Briefcase. But we were especially impressed with the tone from our upright and acoustic basses. The sound was very neutral and clear. These two basses, because of their acoustic design, often sound hollow through other bass amps, or we find ourselves needing to EQ them excessively in order to round out the sound. Upright basses also tend to have a lot of rattles and overtones that amps seem to accentuate. The Phil Jones Briefcase handled these challenges beautifully! The tone was clear and even across all four (and five) strings. The upright sounded like a loud upright — not an amplified upright. This is very good for those of you who need to perform in venues where amplification is necessary and direct sound quality is critical. We were very impressed with the overall sound reproduction that two five-inch speakers delivered. The excellent sound quality is accomplished in part by the speaker placement in the cabinet as well as the cabinet design. The vented cabinet allows the tone to fill the room while the quality of the speakers reproduce the sound of the instrument as accurately as much larger speakers and enclosures. This was a very impressive result that is hard to imagine when you look at how compact the Briefcase actually is. The headphone jack was a nice touch. Many times we all find it necessary to practice when others may be sleeping (or catching up on the latest episode of Big Brother), and this feature was not only very functional but the sound quality was excellent, too. Just make sure you have a good set of headphones to match the quality of the amp. 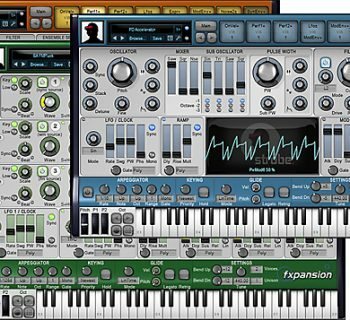 The EQ gave us the ability to dial in the exact tone we wanted with each bass used, and was very musical in character. Many other practice amps just have bass/mid/highs at best. We liked the versatility and full range of tone control that the Briefcase delivered. There was no appreciable signal noise when we added more boost using any of the frequency bands. The balanced output was very useful. The signal we sent to the main board at a recent gig was very clean and true to the sound of the amp without any loss of tone. Again, this was another nice feature that most “practice” amps do not have. The Briefcase was able to provide us with a comfortable monitor level while the sound engineer cranked up the volume to the front-of-house. The owner’s manual was extremely detailed and easy to follow. The basic functions of the Briefcase are very simple, and right out of the box you can use this excellent little amp. When we were curios about the battery options, a quick e-mail to the company resulted in a fast response from Phil Jones himself! That’s what we call product support. The Phil Jones Briefcase (MSRP $995) retails for under $700, a very good price for such pro quality sound and features in a super-compact form factor. No longer does your practice amp have to be a cheap toy that you’re embarrassed to use outside of the house.